Assuming the world doesn’t go into meltdown if he actually gets elected, Donald Trump will promote one of his few Silicon Valley supporters to a judge. The Huffington Post reports – via unnamed sources – that PayPal founder Peter Thiel will be nominated for a seat on the US Supreme Court by Donald Trump. A Thiel spokesperson has denied any truth to the story. In other news, Trump apparently has support from Virtual Reality guru Palmer Luckey. According to the Daily Beast, the Oculus CEO has been funding the pro-Trump PAC Nimble America. The group’s main tactic involves anti-Clinton memes and internet trolling. This week saw two technology giants take aim at things that kill their customers. Microsoft announced this week how it’s trying to “solve” cancer by treating it like almost like a computer problem. This week also saw Mark Zuckerberg and Priscilla Chan pledging $3 billion to “cure, prevent or manage all disease by the end of this century”. An ambitious (and noble) goal, but just $3billion for ALL disease? Not going to happen. The amount of money spent on drug discovery alone these days could probably burn through that in a few years. Despite being the main driver for wearable technology, new research suggests fitness trackers are not actually that good for helping you lose weight. But in the context of the quantified self, this matters little. The two-year study published in the Journal of the American Medical Association (JAMA) took just under 500 overweight people and split them into two groups. One group was given a fitness tracker (in this case FIT Core devices), while the others were left to follow their own diet and exercise plan. The study found that the group given the trackers lost on average 3.6kg, while the self-sufficient group lost an average of 5.9kg each. So you’ve probably heard the rumour that Apple is going to buy either McLaren or Lit Motors. None of the parties involved are admitting to anything right now so we’ll see how that all plays out over the next few weeks. In the meantime, Tim Cook’s company have got their hands on another AI company in the shape of TupleJump. As well as claiming that it’s going to erode AWS’ lead, Oracle has acquired Palerra, Facebook has snapped up prototyping startup Nascent Objects, Google has made a double swipe for Urban Engines and API.AI, Amazon has slurped chatbot startup Angel.ai, Etsy has bought AI search startup Blackbird, CA now owns BlazeMeter, Webroot now owns CyberFlow Analytics, Twilio has paid out for Kurento’s WebRTC team, Extreme Networks has taken over Zebra’s WLAN unit, Airware has swooped for Redbird, and Tech Data Corp has snaffled Avnet's Technology Solutions business. - The NSA and CyberCom may split into different agencies. - The Director at GCHQ thinks DNS-filtering (i.e a UK version of China’s Great Firewall) is a good idea. - Some people want Ed Snowden pardoned, others don’t. - The entire list of North Korean websites open to the web was revealed this week. All 28 of them. - French drones have to broadcast a lot of information, according to new rules. - The London Metropolitan Police commissioner wants the power to remotely hack cars. - Ed Snowden says you shouldn’t use Google’s new Allo app. - Trump doesn’t want the US to cede ICANN to the UN. Well at least it’s an identifiable tech policy. Technology companies and music don’t go together. But that doesn’t stop the two occasionally meeting. The latest attempt at being cool sees IBM roping in DJ Tim Exile to record the random sounds of its Watson data centre and then creating some EDM out of it. You can even create your own beats if you so wish. There’s no shortage of things connected to the internet that don’t really need to be – fridges, toasters, dildos etc. But how about candles? No, not some LED fake ones, but actual waxy, fire-making ones controlled by your smartphone. LuDela thinks you need one for some reason. We like a bit of Brain tech here at IDG Connect. So do scientists at Stamford. They’ve been working on a way to read monkeys’ brain signals so they can control keyboards. 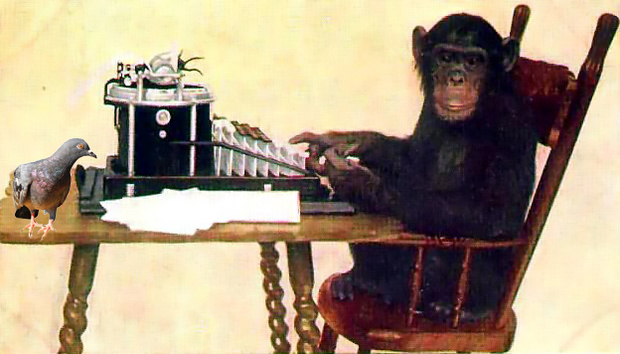 Essentially done as a way to help improve the accuracy of similar technology in humans, the monkeys were able to transcribe passages from the NYT at a speed of 12 words per minute. New research this week also suggested that pigeons can actually read. According to the study, after eight months of training, the little grey birds could learn to recognise (if not actually understand) between 26 and 58 words, and could tell if they were misspelled. Bring the two together and you could have monkeys using brain tech to write messages that pigeons can sub-edit. The next wave of journalism outsourcing awaits? Admittedly it’s a more environmentally-friendly paper bag. But a paper bag nonetheless.